The foot stone is nature’s remedy for dry, rough skin. Contains no chemicals and will not irritate skin. 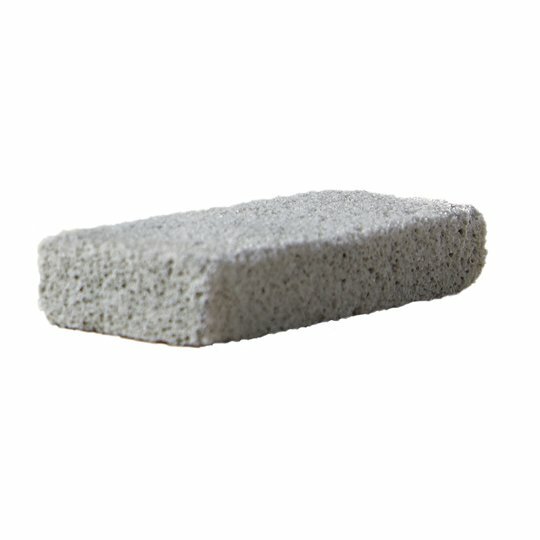 Used for removing corns and calluses from your feet in a gentle, safe and effective manner. When used regularly it will keep skin soft and smooth, preventing the build up of hard callused tissue. Caution: Diabetics should not use this product, nor should persons with poor circulation, irritated skin or pain due to corns and calluses. If in doubt, consult a podiatrist. To pamper yourself simply bathe feet in warm water. 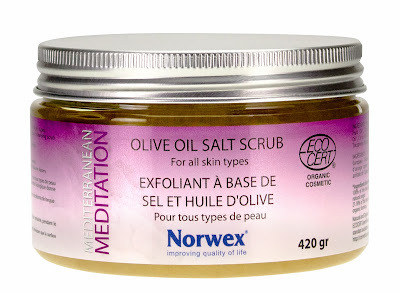 Dip Norwex Foot Stone in bath water, and rub firmly over hard skin. Anti-Gravity goes beyond moisturizing to visibly reducing the signs of aging. 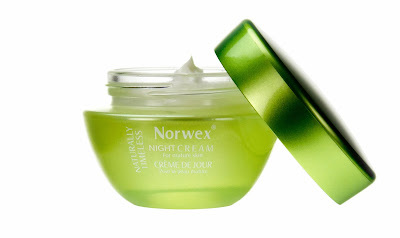 This hydrating cream works while you sleep when most of the rejuvenation and rebuilding activity of the skin takes place. The formula combines plant stem cells for an intense treatment to transform the appearance of the skin achieving a visible lifting result. This advanced Night Cream contains plant Stem Cells - a unique ingredient based on the innovative PhytoCellTecTM technology whose function is to boost the appearance of the skin and to achieve a visibly younger and healthier look. It contains the powerful ingredient MatrixylTM synte 6, with the unique ability to significantly decrease the appearance of wrinkles, ChronodynTM, to reduce the signs of fatigue and ldealiftTM, an innovative ingredient which helps reverse the appearance of sagging and improves resistance to gravity. 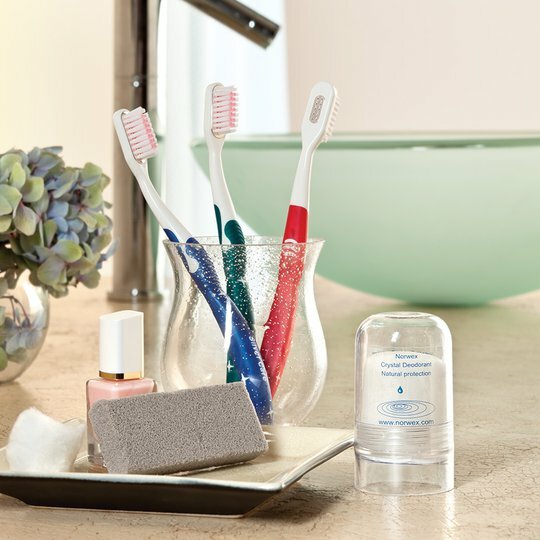 Recommended use: Apply to cleansed skin with gentle patting motions until absorbed. Squalane, Sorbitan Tristearate, Parfum, Benzoic Acid, EDTA, Limonene. Allergy Alert - Nut oil – sweet almond oil (Prunus amygdalus dulcis). Developed to decrease the appearance of wrinkles, to enhance the look of the skin’s firmness and to delay the signs of aging. The advanced Day cream is enriched with plant technology that boosts the appearance of the skin and improves the look of facial contour and definition. The final result is younger looking skin, which appears softer and healthier. Aqua, Isopropyl Myristate, Glyceryl Stearate SE, Glycerin, Isohexadecane, Butylene Glycol, Carbomer, Polysorbate 20, Palmitoyl Oligopeptide, Palmitoyl Tetrapeptide-7, Caprylic/Capric Triglyceride, Teprenone, Malus Domestica Fruit Cell Culture, Xanthan Gum, Lecithin, Cetyl Alcohol, Prunus Amygdalus Dulcis Oil, Olea Europaea Fruit Oil, Peg-40 Stearate, Salvia Sclarea (Clary) Seed Oil, Hamamelis Virginiana (Witch Hazel) Extract, Sodium Hyaluronate, Squalane, Simmondsia Chinensis (Jojoba) Seed Oil, Butyrospermum Parkii, Allantoin, Tocopheryl Acetate, Sorbitan Tristearate, Propanediol, C12-15 Alkyl Benzoate, Polyacrylamide, C13-14 Isoparaffin, Laureth-7, Parfum, EDTA, Benzoic Acid, Phenoxyethanol, Dehydroacetic Acid, Gluconolactone,Sodium Benzoate, Calcium Gluconate, Benzyl Alcohol, Limonene. Allergy Alert- Nut oil – sweet almond oil (Prunus amygdalus dulcis). This innovative Face Serum reduces the appearance of wrinkles leaving the skin looking visibly younger. The formula combines a rich selection of ingredients for an intensive treatment to transform the skin to appear lineless and revitalized. The serum is based on innovative technology which acts to boost the appearance of the skin. Aqua, Glycerin, Methyl Gluceth-20, Malus Domestica Fruit Cell Culture, Xanthan Gum, Lecithin, Behentrimonium Methosulfate, Cetyl Alcohol, Butylene Glycol, Caprylic/Capric Triglyceride, Teprenone, Euglena Gracilis Extract, Carbomer, Polysorbate 20, Palmitoyl Oligopeptide, Palmitoyl Tetrapeptide-7, Salvia Sclarea (Clary) Seed Oil, Amorphophallus Konjac Root Powder, Isohexadecane, Squalane, Olea Europaea Fruit Oil, Simmondsia Chinensis Seed Oil, Dimethicone, Tocopheryl Acetate, Allantoin, Hamamelis Virginiana Extract, Propanediol, Polyacrylamide, C13-14 Isoparaffin, Laureth-7, C12-15 Alkyl Benzoate, Glyceryl Monostearate SE, Parfum, Benzoic Acid, Gluconolactone, Sodium Benzoate, Calcium Gluconate, Dehydroacetic Acid, Benzyl Alcohol, Phenoxyethanol, Limonene. Noteworthy ingredients are the Malus domestica fruit cell culture extract, palmitoyl oligopeptide, palmitoyl tetrapeptide-7, teprenone, Euglena gracilis extract, and gluconolactone. Parabens, no formaldehyde releasers, no mineral oil and no petrolatum. Naturally Timeless – A phenomenal cutting-edge formulation! For those 35 or older who want to fight the signs of aging, help lessen the appearance of age spots and fine lines, Norwex has taken skin care to the next level with this exciting breakthrough. And it is all focused on the natural rejuvenating benefits of an endangered rare apple. This Swiss apple called Uttwiler Spätlauber is derived from a seedling planted in the middle of the 18th century, well-known for its ability to be stored for long periods without shrivelling and thus its longevity potential. Rich in phytonutrients and proteins, the apple offers unique ingredients that, through technology, can be incorporated into skin care products. Through cutting-edge science, the PhytoCell Malus Domestica ingredient has been shown to have excellent results for reducing the appearance of wrinkles. This unique offering is currently one of the most pioneering and innovative breakthroughs in global skin care. The nourishing and refreshing qualities of Aloe Vera, Olive oil and other pure, natural extracts, such as menthol, are formulated to promote a cooling sensation leaving feet feeling refreshed and helping combat odour. Use lotion daily to improve the skin’s appearance, and invigorate tired, overworked feet while providing nourishment for a complete pampered experience. Aqua - Water, Aloe barbadensis - Aloe Vera, Triticum vulgare - Wheat Germ Oil, Algin - Polysaccharide from Seaweed, Olea europaea - Olive Oil, Rosmarinus officinalis - Rosmary, Lavandula angustifolia - Lavender, Citrus limonum, Mentha piperita - Mint, Eucalyptus globulus - Blue Gum, Thymus vulgaris - Thyme, Melissa officinalis - Lemon Balm, Verbena officinalis, Limonene, Linalool, Citral. Petrolatum, Alcohol, Glycols (i.e., propylene glycol, butylene glycol etc. ), Carbomer, Mineral Oil, Synthetic Fragrances or Colours, PEGs (polyethylene glycols), Parabens, Phenoxyethanol, Dimethylamine, Trimethylamine, EDTA (ethylenediaminetetraacetic acid), or Formaldehyde Releasers such as DMDM Hydantoin, Quaternium 15, Imidazolidinyl Urea, Diazolidinyl Urea, Tris(hydroxymethyl) nitromethane (Tris Nitro) etc. A moisturizing, hydrating and nourishing gel for the face and neck to be used after cleansing. This product can hydrate, soothe, smooth, soften skin, and has a firming composition. It is not intended to provide lasting moisture – it functions much like a toner to be used after cleansing and before moisturizing. New airless gel dispenser has an easy dispensing action which is leak-proof; allows for quantity distribution; provides excellent product protection because the gel is not exposed to air, and it is protected from oxidation and contaminants from the exterior environment. It also helps to extend the shelf life of the product. Aqua (Water), Triticum Vulgare*, Olea Europaea* (Olive Oil), Aloe Barbadensis*, Sodium Hyaluronate, Allantoin, Algin, Glycerin, Prunus Armeniaca, Sodium Dehydroacetate, Parfum (Fragrance), Limonene, Linalool. Apply to severely dry skin, cracked feet, dry cuticles and sparingly to hair to tame ends and moisturize the hair follicles. Melt in hand or between fingers, apply with gentle patting or rubbing motion. Synthetic perfumes, Synthetic dyes and Synthetic solvents like propylene glycol. 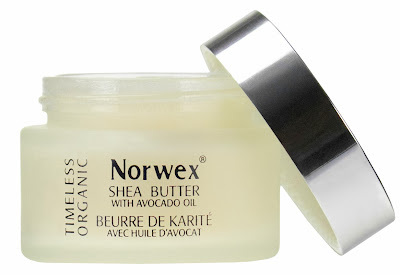 Due to the organic composition, the consistency of the Shea Butter may vary. Allergy alert: Contains oil from the Shea nut. The new apple of our eye combines cutting-edge phytotechnology with outstanding results from a unique ingredient, Prodizia. Extracted from the Persian Silk Tree, Prodizia helps reduce the signs of dark circles, fine lines and under eye puffiness. Just a drop tapped lightly into skin around the eye area, prior to applying moisturizer, will provide the appearance of more youthful skin. After washing hands – apply cream generously and rub until completely absorbed. These natural emollients work together to moisturize and nourish the skin, allowing it to retain moisture, while working to naturally soothe the skin. Ingredients: Aqua (Water), Aloe Barbadensis Leaf Juice*, Olea Europaea (Olive) Fruit Oil*, Cetearyl Alcohol, Glyceryl Oleate, Glyceryl Stearate, Butyrospermum Parkii (Shea Butter)*, Cetearyl Olivate, Prunus Amygdalus Dulcis (Sweet Almond) Oil, Sorbitan Olivate, Simmondsia Chinensis (Jojoba) Oil*, Organic Macadamia Ternifolia Seed Oil*, Gluconolactone, Sodium Benzoate, Dehydroacetic Acid, Benzyl Alcohol, Beeswax*, Citrus Aurantium Dulcis (Orange) Oil*, Citrus Medica Limonum (Lemon) Peel Oil*, Glycerin, Peucedanum Ostruthium (Masterwort) Leaf Extract, Potassium Sorbate, Benzoic Acid, Tocopheryl Acetate. Mineral oil and silicon, Synthetic emulsifiers like PEG (polyethylene glycol), Viscosity controlling agents like Carbomer, Preservatives such as formaldehyde releasers, parabens, or phenoxyethanol, Synthetic perfumes, Synthetic dyes, and Synthetic solvents like propylene glycol. 98.76 % of the total ingredients are from natural origin. 27.48 % of the total ingredients are from organic farming. * Allergy Alert: Contains Macadamia Nut oil and Almond oil. A nourishing muscle massage cream made with Organic essential oils of Rosemary, Lavender and Sage, known to help naturally energize overexerted muscles. Massage the cream, rich with Devil’s Claw and Wolf’s Bane, into tired sore muscles to promote the sensation of tension release. Peppermint and Scots Pine help refresh and cool. Aqua (water), Aloe Barbadensis*, Triticum Vulgare*, Algin, Olea Europaea*, Lavandula Angustifolia (Lavender) *, Salvia Officinalis (Sage)*, Rosmarinus Officinalis (Rosemary)*, Citrus Dulcis*, Harpagophytum Procumbens (Devil’s Claw), Arnica Montana (Wolf’s Bane), Mentha Piperita (Peppermint Oil), Pinus Sylvestris (Scots Pine), Linalool, Limonene, Geraniol. Synthetic solvents like propylene glycol. A delicate massage with a small quantity of Leg Cream helps to relieve dry skin. Daily use may help to improve the aesthetic look, and may reduce the look of cellulite. Apply to legs as needed. Aqua (Water), Triticum Vulgare*, Zea Mays, Menthol, Mentha Piperita, Aloe Barbadensis*, Olea Europaea* (Olive Oil), Algin, Centella Asiatica, Ruscus Aculeatus, Eucalyptus Globulus, Carbomer, Sodium Benzoate, Limonene, Linalool. See also: http://www.fastgreenclean.com/2018/01/norwex-lip-balm.html for our flavored lip balm, released in January 2018! Enriched with Dead Sea salts; this remarkable, organic cleansing scrub contains grains that remove dead cells, giving skin a smooth look and velvet feel. The essential oil inspires a lingering sense of ease and relaxation. Contains no preservatives, perfume free. Use with caution; product contains oil that may cause surface to become slippery. For all skin types. Recommended use: Massage over entire body during bathing, once or twice a week. Maris Sal (Dead Sea Salts), Olea Europaea Fruit (Olive) Oil*, Citrus Aurantiun Duclis Oil*, Citrus Medica Limonum Peel Oil*, Tocopheryl Acetate. 21.18 % of the total ingredients are from organic farming. Mineral oil, Emulsifiers like PEG, Carbomers, Parabens, Synthetic perfums and dyes, Fatty acids or alcohols, Propylene Glycol. Click here https://drive.google.com/file/d/0B_0pnZ1qQ18FQ0hEaE9jb2Q0ZXM/edit?usp=sharing to see the full graphic. At night is when the skin rejuvenates and rebuilds itself. 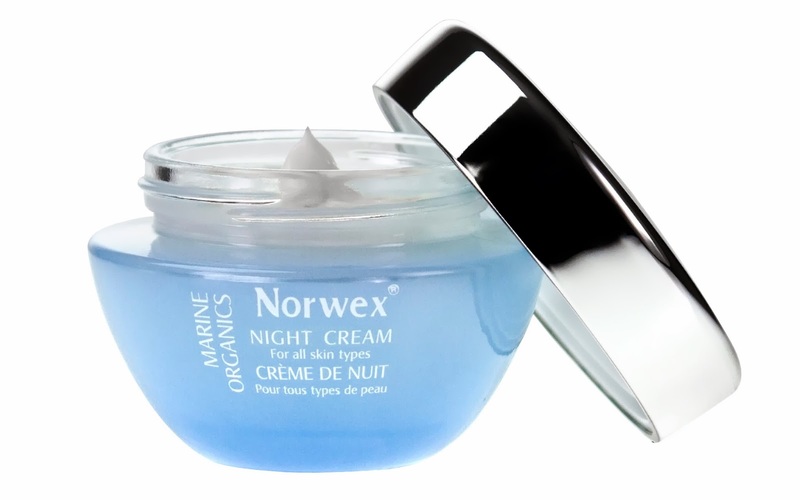 This unique certified organic Marine Moisturizing Night Cream works overnight so skin appears rested and revitalized. Marine moisture delays the appearance of wrinkles and smoothes and lifts the look of skin while you sleep. This product is enriched with certified organic Aloe Vera, Shea butter and Jojoba & Olive oils which deeply moisturize and relax the skin. After continual use the look of skin begins to improve and the skin feels firmer, looks younger and appears more defined. Aloe Barbadensis Leaf Juice*, Tricaprylin, Cetearyl Wheat Straw Glycosides, Cetearyl Alcohol, Squalane, Butyrospermum Parkii(Shea Butter)*, Aqua, Glycerin ,Parfum, Glyceryl Stearate SE, Cetearyl Olivate, Sorbitan Olivate, Propanediol, Alaria Esculenta Extract, Caprylic/Capric Triglyceride,Crambe Maritima Extract, Secale Cereale(Rye) Seed Extract*, Sodium Hyaluronate, Simmondsia Chinensis(Jojoba) Seed Oil*, Olea Europaea(Olive) Fruit Oil*, Glyceryl Stearate Citrate, Tocopheryl Acetate, Glycerin Caprylate, Beeswax*, Dehydroacetic Acid, Benzyl Alcohol, Citric Acid, Benzoic Acid, Benzyl Salicylate, Citronellol, Linalool. 70.49 % of the total ingredients are from Organic Farming. Note: Tocopheryl acetate is vegetal source from non-GMO sunflower oil and is considered non- allergenic. 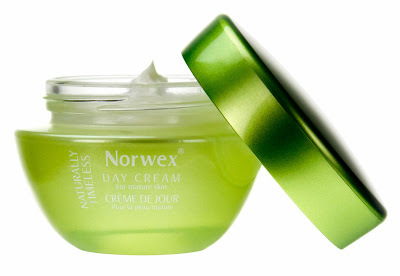 Noteworthy ingredients are the Alaria esculenta extract and the Crambe maritima extract as well as rye (Secale cereale), aloe, squalane, cetearyl wheat straw glycosides, shea butter, sodium hyaluronate, jojoba oil, olive oil, and vitamin E.
In comparison to the day cream this formula does not contain Pelvetia canaliculata , but it does contain rye extract, which is firming in nature. Also, it is a little richer having higher amounts of the emollients tricaprylin and organic shea butter. Allergy Alert: This product contains Secale cereal (rye) seed extract – a source of gluten at 19 ppm. 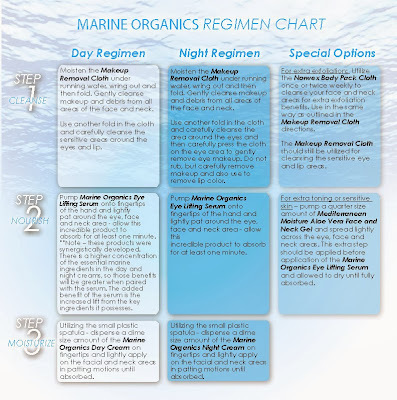 A certified organic Marine Moisturizing Day Cream specially developed to revitalize and restore skin’s youthful appearance. The active moisturizer contains carefully selected ingredients from Marine origin to moisturize aging skin and reduce the appearance of wrinkles while transforming your skin to appear lineless and refreshed. 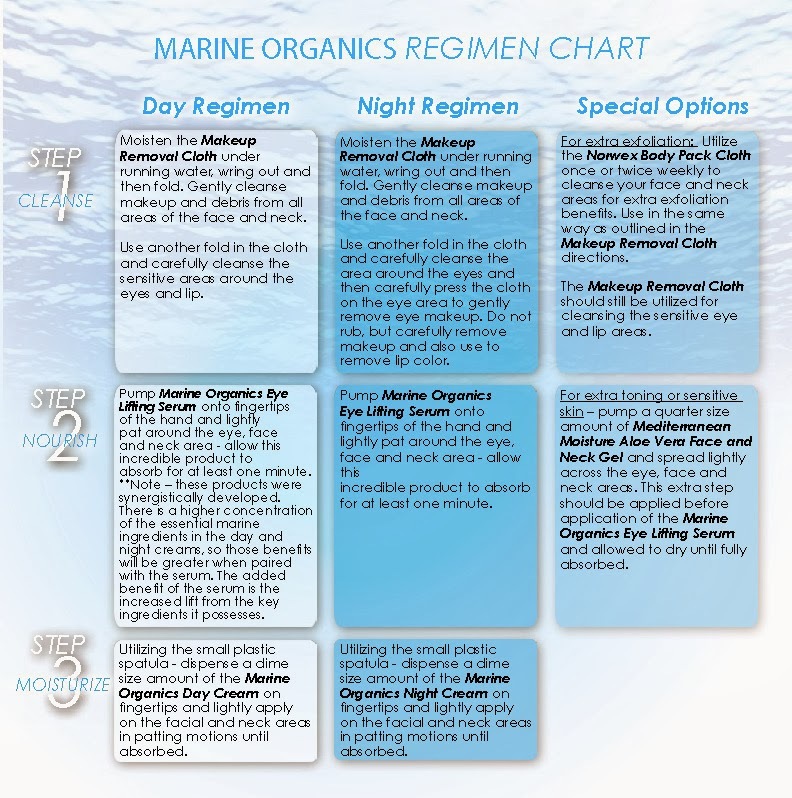 Marine Moisturizing Day Cream contains certified organic additives: Aloe Vera, Shea butter and Olive & Jojoba oils. Daily use of the cream fights the signs of aging caused by free radicals and oxidative stress, resulting in skin that appears healthy, young and fresh. Aloe Barbadensis Leaf Juice*, Tricaprylin, Squalane, Cetearyl Wheat Straw Glycosides, Cetearyl Alcohol, Aqua, Glycerin, Parfum , Butyrospermum Parkii(Shea Butter)*, Cetearyl Olivate, Sorbitan Olivate, Glyceryl Stearate SE, Propanediol, Pelvetia Canaliculata Extract, Alaria Esculenta Extract , Caprylic/Capric Triglyceride, Crambe Maritima Extract, Simmondsia Chinensis(Jojoba) Seed Oil*, Olea Europaea (Olive) Fruit Oil*, Sodium Hyaluronate, Glyceryl Stearate Citrate, Tocopheryl Acetate, Glycerin Caprylate, Dehydroacetic Acid , Benzyl Alcohol, Citric Acid, Beeswax*, Benzoic Acid, Benzyl Salicylate, Citronellol, Linalool. 99.19 % of the total ingredients are from natural origin. 73.20 % of the total ingredients are from Organic Farming. Noteworthy ingredients are the Pelvetia canaliculata extract, Alaria esculenta extract, and the Crambe maritima extract as well as aloe, squalane, cetearyl wheat straw glycosides, shea butter, sodium hyaluronate, jojoba oil, olive oil, and vitamin E.
Our certified organic Marine Body Lotion is fortified with Olive Oil and Jojoba to transform skin to feel hydrated and protected. This ultra-conditioning Lotion is enriched with Shea Butter and advanced bio-marine ingredients carefully selected from the ocean. Pamper your skin and enjoy the power of nature to affect your body and soul. Recommended use: Massage all over the body until completely absorbed. Citronellol, Eugenol, Farnesol, Geraniol, Isoeugenol, Limonene, Linalool. 99.29% of the total ingredients are from natural origin. 80.49% of the total ingredients are from organic farming. 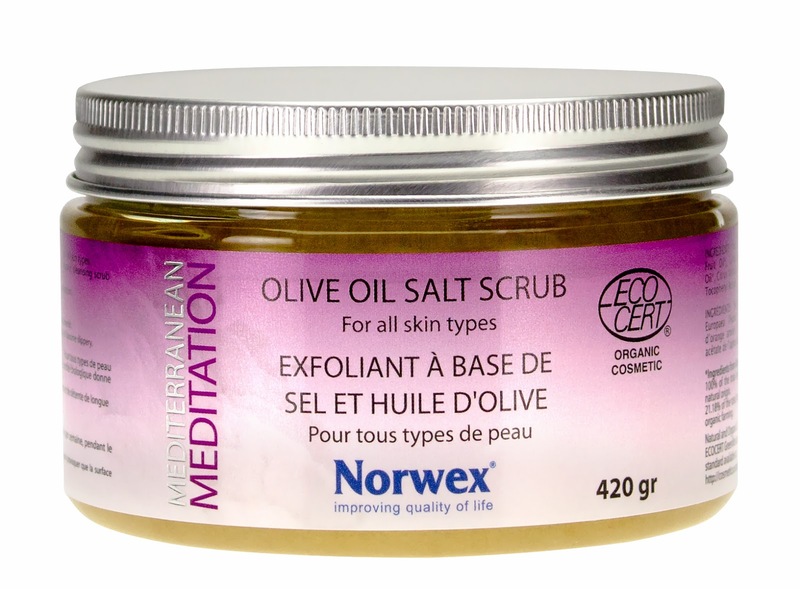 Noteworthy ingredients include aloe, olive oil, tricaprylin, squalane, Shea butter, and jojoba oil as well as Plukentia volubilis seed oil – an amazing source of omega 3, 6, and 12 essential fatty acids and Buddleja davidii (butterfly bush), Thymus vulgaris (Thyme) extracts and Pelvetia canaliculata, Alaria esculanta, and Crambe maritime. It's been cloudy, gloomy, and raining here in Greensboro, NC for the past oh, 8 days or so (give or take). Today the sun made an appearance (Yay! Free Vitamin D!). 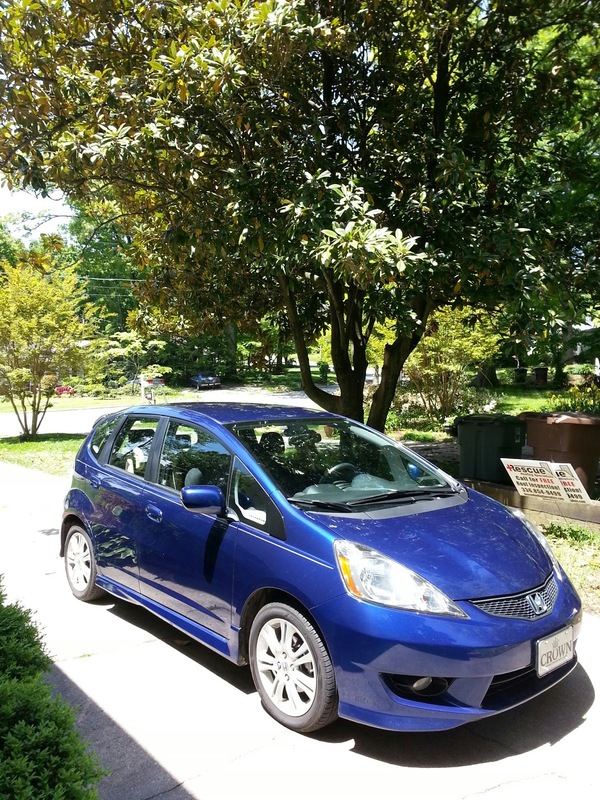 You'd think day after day after day of pouring down rain would have washed the yellow sheen of pollen off my beautiful blue car, but no. That would be incorrect logic, as evidenced by my (still) pollen-covered car. I bribed the two little ones to have "quiet time" after lunch today. I even offered up a milkshake or smoothie in exchange for their cooperative participation in quiet time. 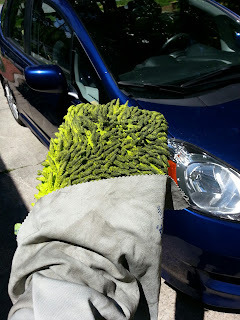 Then I hustled to get my Norwex Car Wash Mitt and Norwex Car Cloth, so I could super-quick clean my car. The pollen HAS to go. I wet the Car Wash Mitt with water in my kitchen sink, squeezed out any excess, and put it on my left hand, and held the Car Cloth in my right hand. Armed with my Norwex, I headed outside to the driveway. I started with the passenger side, and moved my way around the car. It took me exactly 7 minutes and 49 seconds to clean and polish the entire body of my car. You can see in the picture the pollen (on the left) and the part I wiped with the Car Cloth (on the right). You can also see me thinking I'm all slick taking a picture of my car, without realizing my reflection was in the photo. Whoops. I swapped out the Car Mitt and Car Cloth for my regular trusty Enviro Cloth (damp with water) and Window Cloth, and headed back out to do the windows. I didn't need to swap them out - the Car Wash Mitt and Car Cloth would have easily done the windows too - but mine were REALLY dirty after washing my car, and I was feeling lazy and not really feeling like spending the extra minute to rinse them out. I did the inside and outside of all the windows on my car. Did you know that kids like to press their dirty, grimy little hands to the windows of the car, to leave a lasting impression of their adorable little handprints? 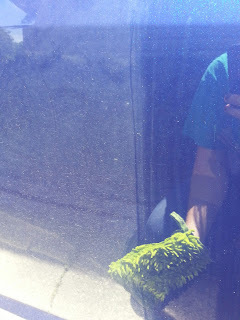 Clean car, and check out all that dirty pollen on my Car Mitt and Car Cloth! The best part? My car is parked under a beautiful tree, which is "snowing" pollen, as my kids like to call it. Guess what? That pollen is falling all over my clean car. See my pretty clean car, underneath that beautiful tree? Yes, that is the same tree that is causing my car to be covered in pollen. Next time, instead of "quiet time" for the kids, they can wash the car. No buckets, no hoses, no soap, and no toxic chemicals needed. Just a few Norwex Cloths for each of them, and they can go to town. P.S. These products would be great for anyone who has a car. I think about how much money I have spent on car washes ($8 to go through the automatic car wash, and that's just the exterior!) and this took me hardly any time at all. It was easy, quick, and didn't require any cleaners or chemicals - just water. I didn't need buckets, sponges, soap, or a hose. And now that I know how easy it is, and how safe it is, the kids can do it too. Sounds like some warm-weather fun in our future! Norwex is in the news! A News station in Madison, Wisconsin puts Norwex to the test. See for yourself what they had to say. The University of Wisconsin-Madison Institute for Biology Education helped with the testing of how effective the Norwex microfiber cleaning cloth performed using a Petri dish. "Based on one sample test, the Norwex cloth was just as effective as the conventional cleaner. The bacteria was minimal in both of the Petri dishes." The testers in the video segment seemed to like the Norwex Enviro Cloth and Window/Polish Cloth. They were impressed by the "butter test" (watch the video to see it!) and it was equally as effective as traditional chemical cleaners. The reason the testers didn't LOVE the Norwex products? Because they didn't leave a "clean" smell. What does this mean? Is it truly a downside? We realized early on that household pollutants negatively impact our health and our environment. Most of the chemicals in cleaning and personal care products that people are exposed to every day have never been assessed for their impact on human health. Indoor air pollution is one of the top five highest ranking environmental health problems in America with chemical levels up to 70 times higher than outside. Research and information on the health effects of manufactured chemicals has not kept pace with their development and use. In the last 50 years, the global production and use of manufactured chemicals has increased substantially. More than 80,000 new chemicals have been created. Evidence shows homes have chemical levels up to 70 times higher than outside. Most of the chemicals that people are exposed to every day have never been assessed for their impact on human health. Parabens utilized in personal care for decades have been shown to have potential harmful effects. What we do know is the harm chemicals have on humans is extensive. Most concerning are the growing links to chemicals that surround us in everyday life. They are linked to serious diseases such as birth defects, cancer and psychological abnormalities. Many today believe the extensive use of chemicals indoors contributes to many of our ‘modern’ diseases such as allergies and asthma. Our mission at Norwex is to improve quality of life by radically reducing the use of chemicals in personal care and cleaning. In addition, the Norwex products make cleaning faster and more cost effective than traditional cleaning products. Did you know that many household cleaners contain formaldehyde, phenol, or both? Chemical exposure has many consequences. Autism rates are now 1 in 88 and the rates are rising. Although there is no one known cause of Autism, it is thought that one of the causes may be environmental (such as exposure to chemicals-both inside the house and out). What does this mean? What can you do? Start small. Take baby steps. Work to protect yourself, your family, your pets, and your friends. 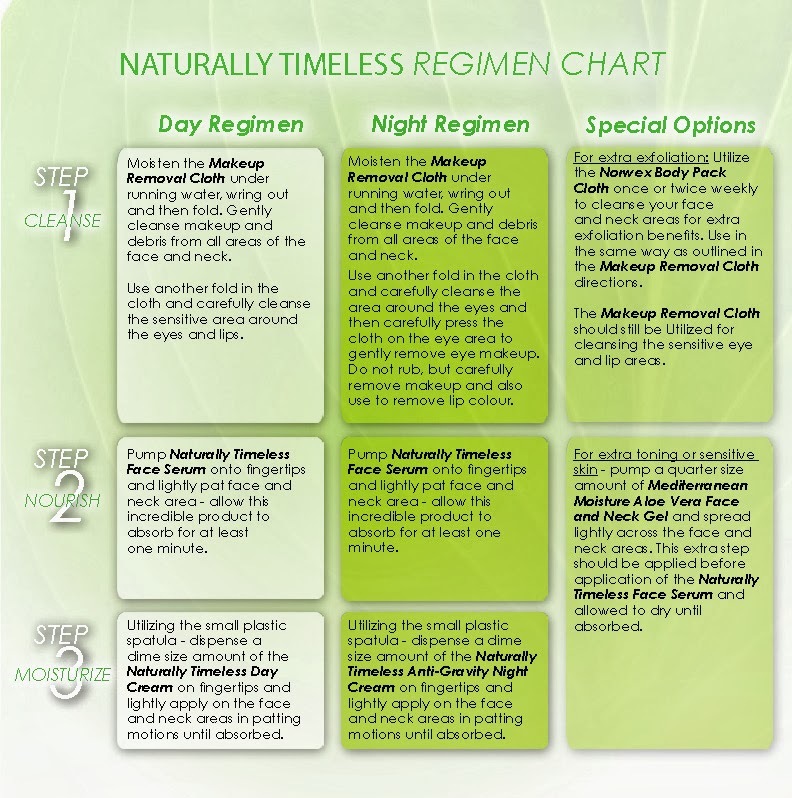 The Norwex mission is to "improve quality of life by radically reducing the use of chemicals in personal care and cleaning." Educate yourself about what you're exposing your body, your children, and your pets to. Make small changes; even small changes will have an impact! Thank you Amanda Theys for compiling the bulk of this information! Do you hate cleaning your floors? Are you looking for an easy and extremely effective method for cleaning your wood floors, laminate, and tile? Tohe Norwex Mop can solve all your woes! To get started with the Norwex Mop, you'll need the telescopic mop handle and mop base. The handle is adjustable in height (it should be as tall as your chin for proper use) so that you can expend the least amount of energy while mopping your floors. It's adjustable from 98 cm to 160 cm to accommodate a large variety of users - just twist to the proper height! It is available in blue/green and gold/rose gold. The mop base is extremely durable and comes in two sizes - small (blue/green) and large (blue/green or silver) - to suit your cleaning needs. It easily snaps into the telescopic mop handle, and can freely rotate or you can use the easy locking mechanism to keep the base firm when washing walls. 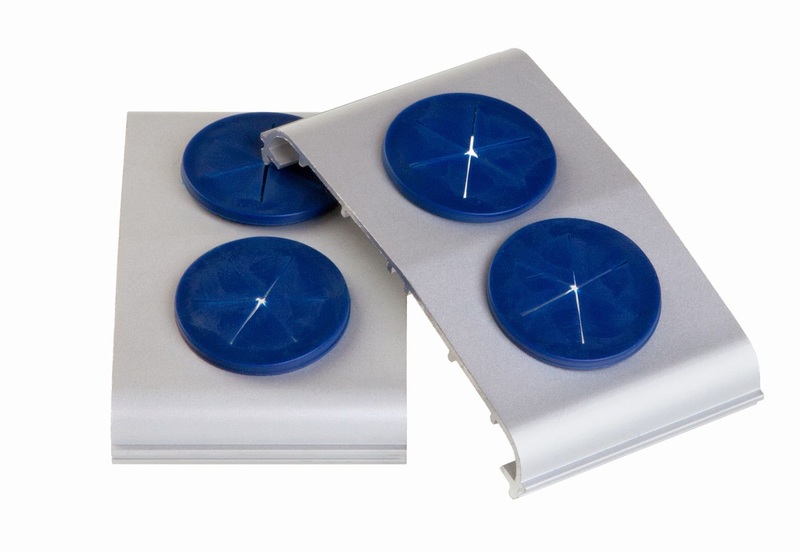 Velcro® strips secure the Mop Pads (described below) to the base, and rubber edging protects walls and furniture. 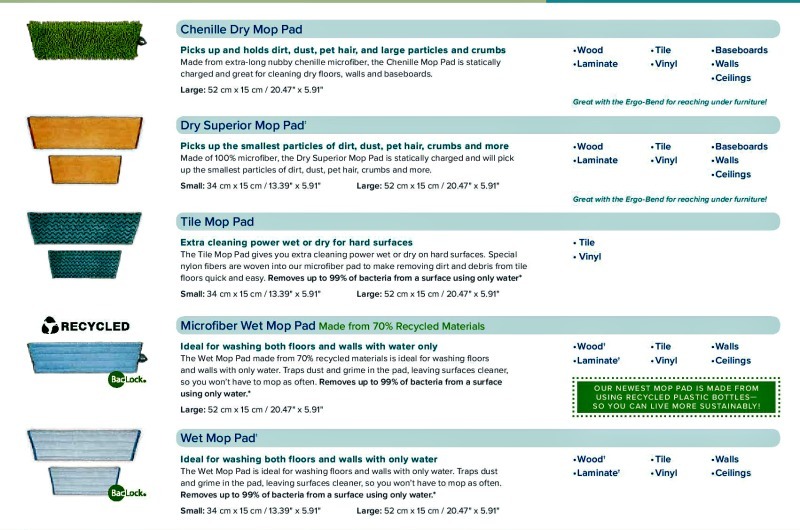 The Norwex Mop Pads come in both dry and wet options. 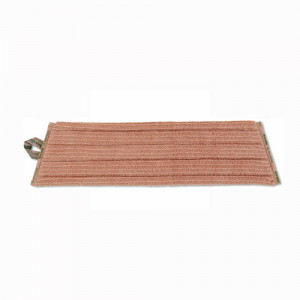 Our dry mop pads employ a static charge that attracts dust to the mop like a magnet. They are extremely efficient for cleaning floors, ceilings, walls, ceiling fans, and high windows. The static charge attracts dirt, dust, pet hair, crumbs, and micro particles like a silent vacuum cleaner, and prevents the particles from flying through the air and being displaced. Routinely dry mopping will significantly minimize the amount of dust on your floors that could be picked up by airflow and carried to all other surfaces in your home. The Dry Superior Mop Pad (yellow) is great for large flooring areas, especially where there are children and pets. It is 100% microfiber, and will pick up even the smallest particles of dust, dirt, pet hair, and crumbs. It comes in size small (34 cm x 15 cm / 13.39" x 5.91") and size large (52 cm x 15 cm / 20.47" x 5.91"). 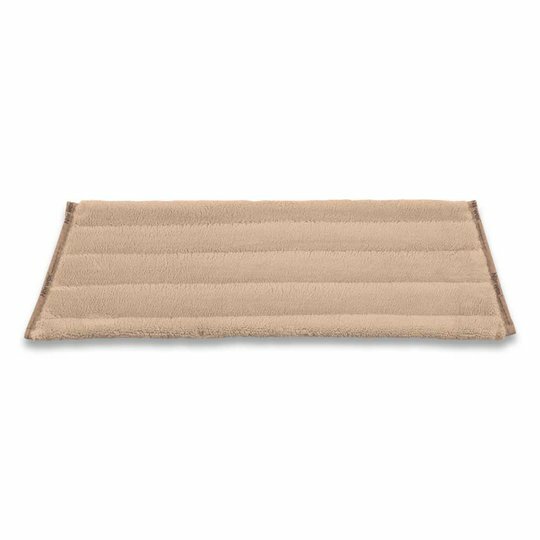 The Dry Superior Mop Pad Made from 50% Recycled Materials (champagne) is only available in size large (52 cm x 15 cm / 20.47" x 5.91"). The Chenille Dry Mop Pad (green) picks up and holds dirt, dust, pet hair, and large particles and crumbs with its extra-long nubby chenille microfiber, and is statically charged and great for cleaning dry floors, walls and baseboards. It is only available in the large size (52 cm x 15 cm / 20.47" x 5.91"). 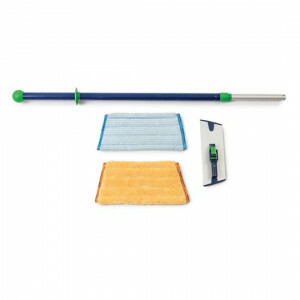 The dry mop pads easily attach to the Velcro® on the Mop Base. You should always use a Dry Mop before using the Wet Mop. Regular use of dry mopping will preserve hardwood and tile floors, and reduce the wear and tear on surfaces. To use it, start by dusting the edges from the furthest point in the room back toward the exit or door, then move the Dry Mop in a figure 8 pattern, keeping the leading edge of the mop forward at all times. The rotating mop base makes this easy and allows you to reach hard to access areas (including under furniture, tables, and appliances)! Following this pattern will keep all the dust collected on the same side of the mop. Pair it with the ErgoBend to easily reach under and behind appliances and furniture! Dry Mop Pads can be cleaned by shaking them outside, and using it multiple times before laundering. It can also be vacuumed, or (my recommended method) brushed off in the garbage can using the Norwex Rubber Brush. 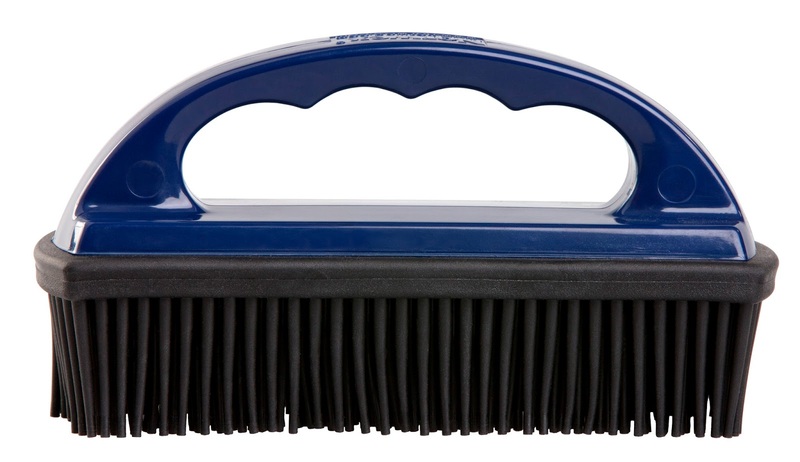 The Rubber Brush is also great for removing pet hair from furniture! Dry Mop Pads should be laundered with other lint-free laundry, and the recommended detergent is Norwex Laundry Detergent. You should not use bleach or fabric softener. Norwex Rubber Brush - great for cleaning the dry superior mop pad! The Wet Mop Pad is made of BacLock™ microfiber and can be used on all washable surfaces such as floors, walls, ceilings, and windows. It also comes in two sizes - small (34 cm x 15 cm / 13.39" x 5.91") and large (52 cm x 15 cm / 20.47" x 5.91"). The second wet mop pad option is the Recycled Microfiber Wet Mop Pad made from 70% Recycled Materials and is available in blue or rose quartz, only in the large size (52 cm x 15 cm / 20.47" x 5.91"). It is made from using recycled plastic bottles to help you live more sustainably! Ideal for washing both floors and walls with water only, both of our wet mop pads are ideal for washing floors and walls with only water. The wet mop pads trap dust and grime in the pad, leaving surfaces cleaner, so you won’t have to mop as often. Removes up to 99% of bacteria from a surface using only water. * Moisten the Wet Mop Pad under running tap water, and wring out well before attaching it to the Mop Base. The mop can then be moved back and forth over the surface. When the friction lessens, you can move it in a figure 8 just like in the Dry Mop Pad description. For difficult stains, spray water on the surface and rub more vigorously, or place your foot on the base to give additional force if needed. The friction will be the greatest the first time the mop is used since the surface at that point will have more dirt. When mopping, do not use soap! For laminate and hardwood flooring, always go with the grain. Putting excess water on mop pads can result in streaking; wood or laminate floors need to be cleaned with minimal moisture as using too much water can cause the wood to swell and possibly crack the finish. Norwex also offers a Tile Mop Pad, specifically designed to clean tile floors. It gives you extra cleaning power wet or dry on hard surfaces. Special nylon fibers are woven into our microfiber pad to minimize effort while removing dirt and debris from tile floors. The Tile Mop Pad is available in small (34 cm x 15 cm / 13.39" x 5.91") and large (52 cm x 15 cm / 20.47" x 5.91") The tile mop pad isn’t just for tile floors though! The zig zag pattern maximizes cleaning power on hard surfaces - tile flooring, textured linoleum flooring, boats, and difficult to clean hard surfaces - it’s perfect for those cleaning jobs where you need a little extra scrubbing power. To care for your Wet Mop pads, we suggest rinsing wet mop pads in warm water and using them again before being washed. You will find that one mop head will clean your entire floor! It can be used until the front inch of pad shows signs of being dirty. You can brush it off with the Rubber Brush after use. It can be washed with regular lint-free laundry, just do not use bleach or fabric softener as these products will destroy the ability of the mop pad to clean effectively. We recommend using Norwex Ultra Power Plus as your laundry detergent. 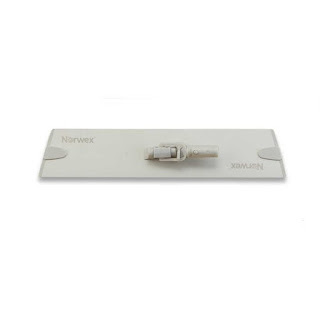 As an extra option, Norwex offers Mop Conversion Kit, or brackets, which are durable rubber grommets that attach to the mop base, allowing you to convert your Mop to a window or ceiling washer and can be used with a Window Cloth, Enviro Cloth, or Car Cloth to wash and polish hard to reach areas. Please note that when cleaning walls and windows, be sure to use the mop in one direction - push/pull action can flip the mop base, resulting in potentially scratching a surface. 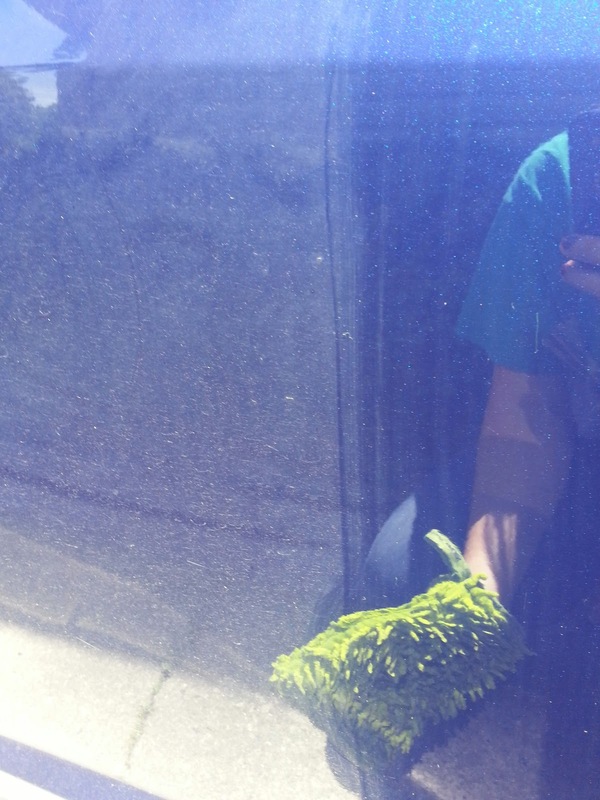 For dirty outside windows, clean with a Wet Mop pad first, then follow with the Car Cloth or Window Cloth. Dust bunnies hide beneath couches, beds and other large furniture. 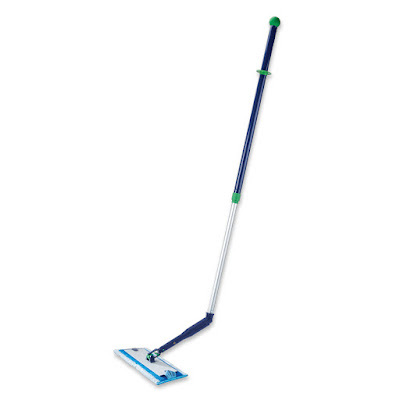 The flexible and convenient Ergo-Bend mop attachment extends your reach. 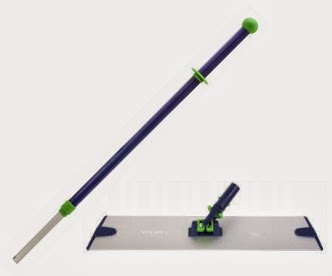 It attaches to any of our Mop Bases and Telescopic Mop Handles, so you can give your home the deep, powerful clean it deserves, with no bending, stooping or squatting required! Use it to help clean beneath your couch, bed and other large furniture, giving your home a deep, powerful clean without using any harmful chemicals. 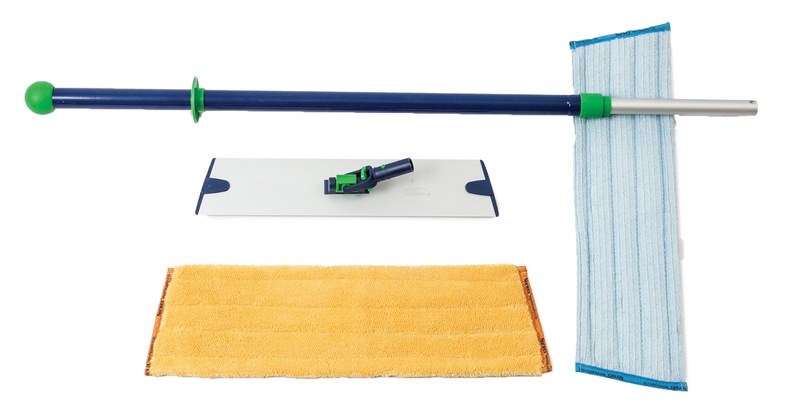 Mop Base, Telescopic Mop Handle and Mop Pads not included. 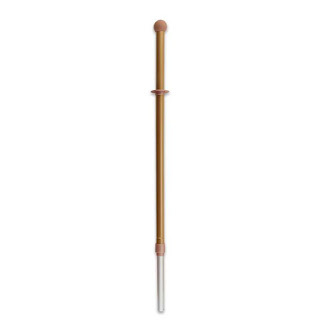 Size: 22.86 cm / 9"
Tall, telescopic adjustable handle - no bending! Why is the Norwex Mop System superior to steam cleaners? Need more convincing? Read this article on Consumer Digest about steam cleaners. It states that to sanitize floors, the temperature of the steam has to reach a certain level or it will take longer - and that manufacturers don't always state how long the mop should be in one spot to actually sanitize. On the flip side, if you hold a steam mop in one spot it will discolor and/or warp your floors. Still have questions? Let me know! I have additional resources on this topic that I am happy to share. Furthermore, if you are local, I am able to travel and demonstrate using my Norwex Mop - I will even use your typical floor cleaning method first, and follow it with Norwex Mop so you can see exactly how much dirt and grime was left behind! Please note - if you have used other floor cleaning methods in the past, it may take several uses to break down all the residue of your previous cleaners on your floors. A little persistence and time will allow Norwex to bring your floors back to a real clean! If you have kids at home, the Norwex Kids Mop Package (discontinued) will allow your little helpers to contribute too! Mopping with Norwex makes cleaning fun - and the Kids Mop is in bright colors and appropriately sized for children. The existing small pads will fit the Kid's Mop base. Is there a proper way to clean with the mop? What is the difference between the Dry Mop Pad and the Dry Superior Mop Pad? How do I use the mop to clean my windows and polish hard to reach areas? 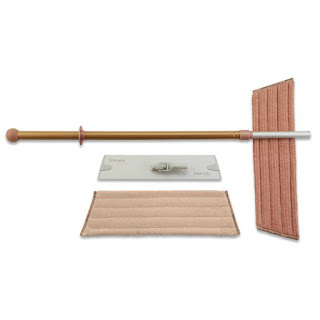 Attach the Mop Base Brackets onto the top side of the Mop Base and fasten the Window Cloth, Enviro Cloth or Car Cloth in place by wrapping it around the Mop Base and firmly pressing the cloth into the rubber grommet slits on the Mop Base Brackets. Lock the base by pushing the green lever until it locks into position.